I don’t know about you but by the time August rolls around every year, I’m already itching to bust out all my fall decor and start covering everything in pumpkins! I just love fall so much that it is one of my most favorite times of year to decorate (besides Christmas, of course!). However, it is very difficult to get into a fall mood when it is still eleventy billion degrees in the shade (thanks, Texas). Also, my husband and children are often very, very confused when they come home to find pumpkins and fall leaves and hay bales around the house when school hasn’t even started yet. So, for the sake of my family’s sanity, I’ve decided to try something a little different this year. I’m going to try to pull off some “late summer” decor that incorporates just a little bit of fall flavor while still holding on to the last bits of summer. 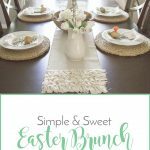 I needed some inspiration to get started and you know I love me some Pinterest when it comes to decorating inspiration! 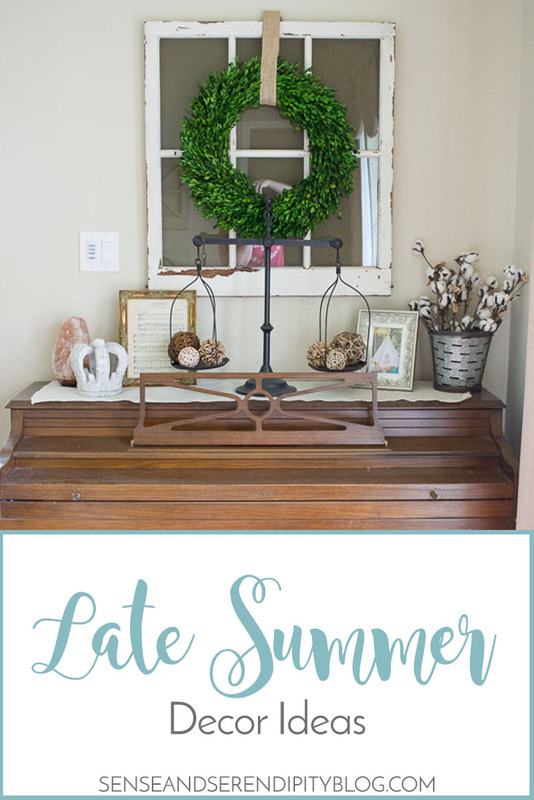 Here are some of my favorite ideas that I found and that I hope I can incorporate into my own “late summer” style! 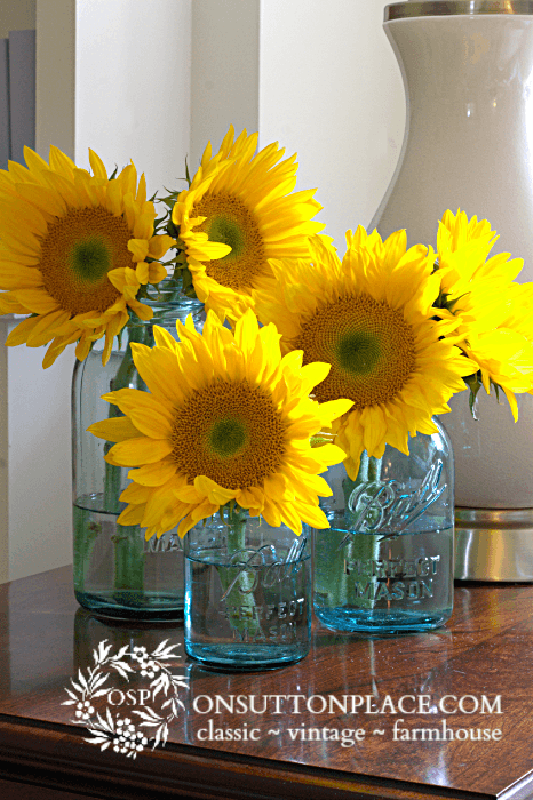 Sunflowers are a wonderful way to usher in late summer decor! They are the perfect floral to decorate with and they will last you into early fall. And look at the lovely contrast between the yellow of the flowers and the blue jars. Stunning! Cotton stems are one of my favorite things to decorate with any time of year, but especially when fall comes around! They are so versatile and bring a beautiful, neutral floral option into a space. 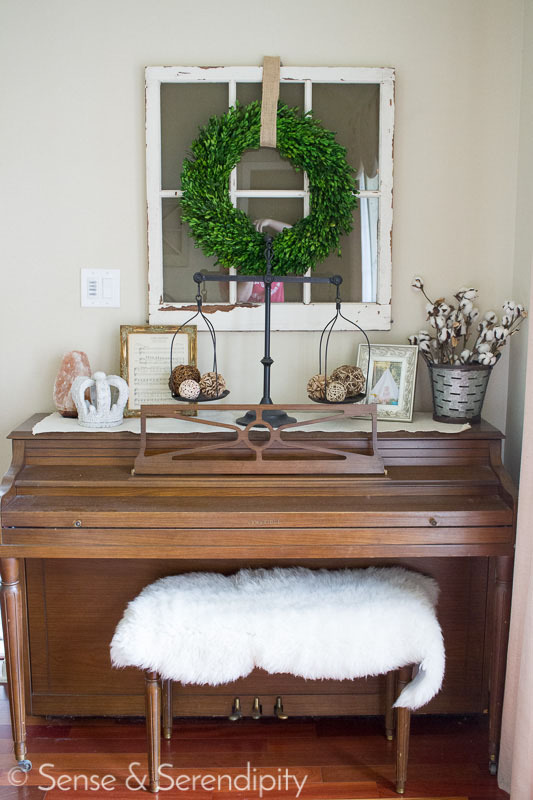 You can incorporate it in a wreath like this one above or you can just pop a few stems into an old galvanized bucket like I did on my piano. 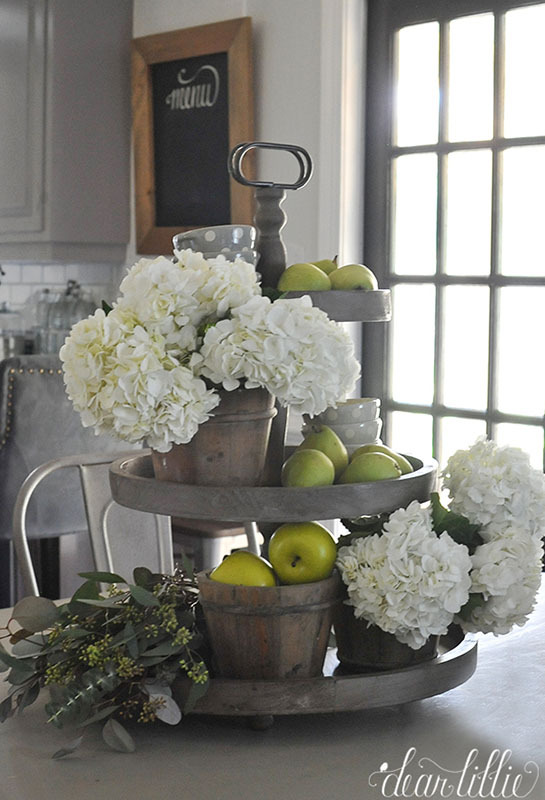 I love to decorate with apples and pears in the late summer/early fall. 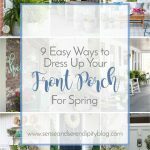 You can use fresh ones in your kitchen because they are in season around this time, or you can use really good fake fruits to display if you don’t want to worry about the fruit going bad too soon. Using fruit in your decor is a great way to infuse a pop of color in your space as well! Buffalo check is very trendy right now and for good reason! It such a fun and cozy pattern but it doesn’t necessarily scream “FALL!” like a plaid might. 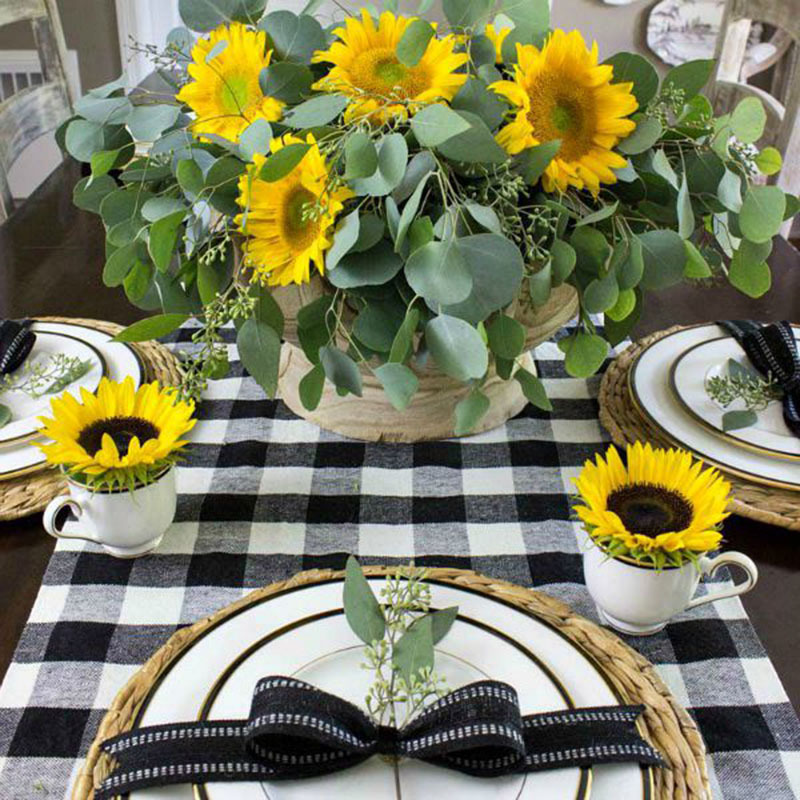 I love this black and white tablescape with the pop of sunflowers. This is a perfect late summer table! 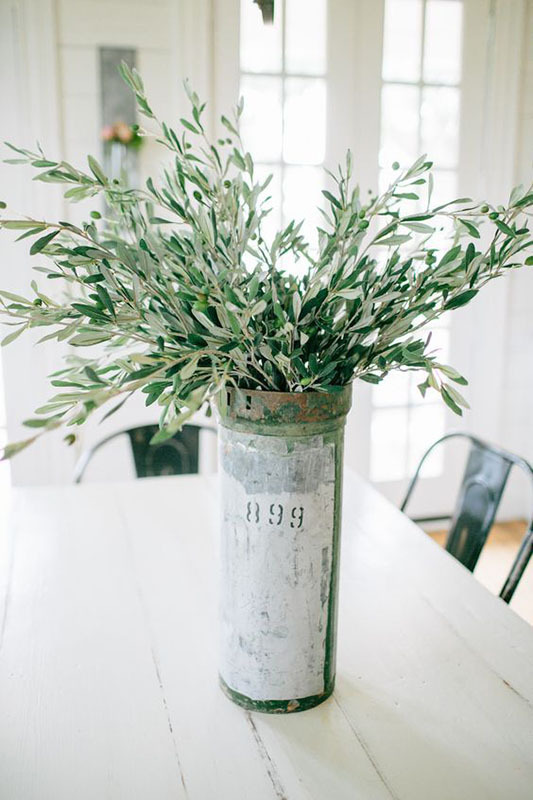 Olive stems are quickly becoming another favorite go-to item in my decor. I love the simple elegance they bring to a space. 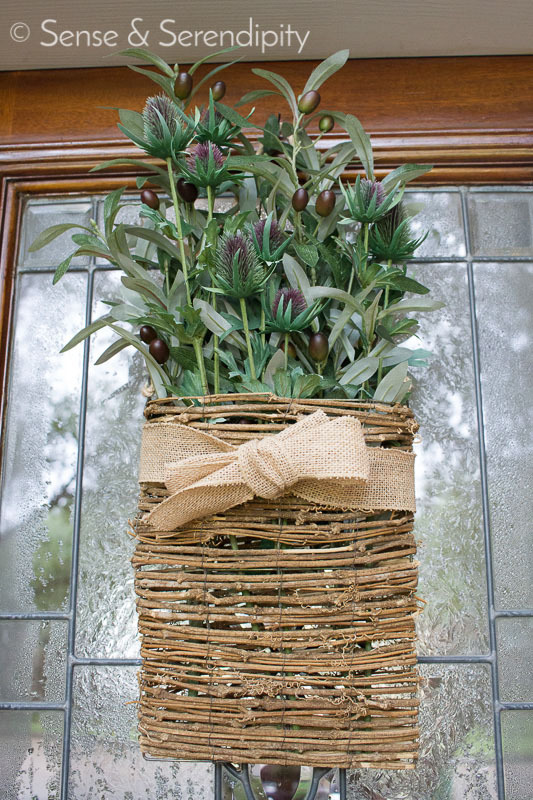 I love them gathered in a simple vase or bucket or as the centerpiece of a late summer door hanging like the one I created for my front door. I added some thistles just for a bit of purple with that lovely dusty green of the olive leaves. If you have kids, this is a fun way to decorate and get your kids mentally prepared for what’s just around the corner. 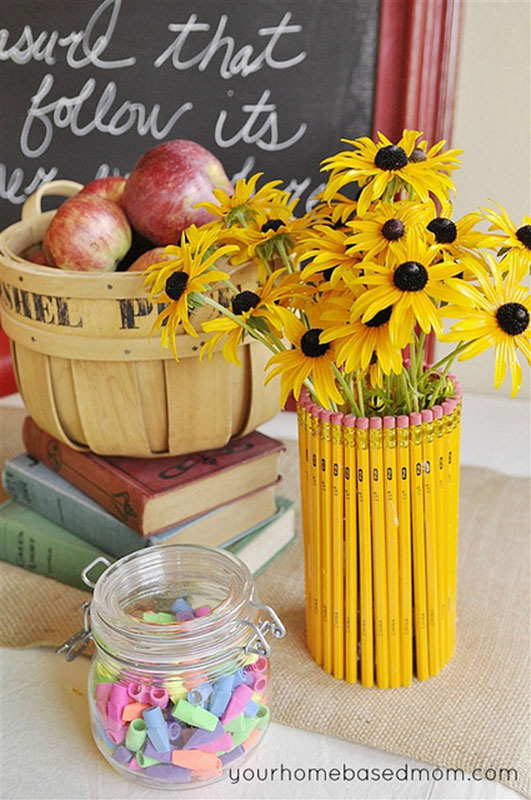 Personally, I love school supplies and the idea of decorating with them is such a unique and cute way of welcoming that time of year into the home. School kids may not agree, but what do they know, anyway? 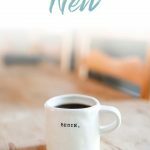 I am hoping that by incorporating some of these great ideas into my late summer decor, I can hold off the full-blown fall decor for just a few weeks longer. But I may still have to sneak a small pumpkin or two in somewhere! Love the sunflowers and black check. 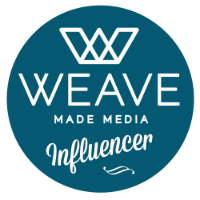 I’m more of a modern girl and not a farmhouse look- but I can use the black check idea! 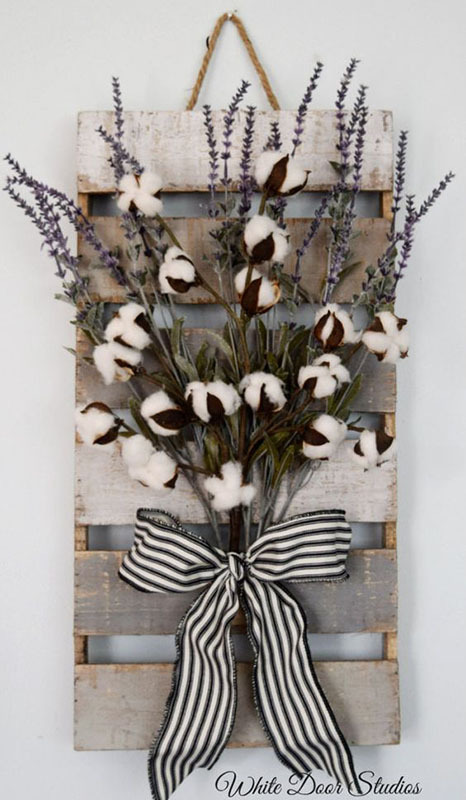 My favorite is the cotton flower decor! Sunflowers are some of my favorites this time of year. They’re perfect! Great ideas. 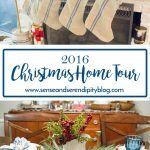 I never think of doing a wreath this time of year – but why not! Also, I have to remember to bring my black eyed susans in the house and enjoy them inside too. Thanks for the inspiration! I love how simple and easy these are to make. 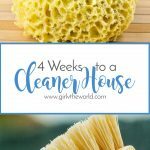 You can spruce up your home super easy right before the Fall. Oh wow, the sunflowers and the buffalo check take me straight back to 1994! You know you’re a design nerd when you remember things like this from your childhood. Lol. Cute ideas! Love the olive stems!